To Do List: Joining in on the Q3 "Finish-A-Long"
King Chevron quilt up on the design wall. Recently I stumbled upon a "Finish-A-Long": rather than joining in with people on making a specific new quilt, people have joined together to finish projects that they've already started. 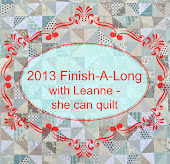 This FAL is hosted by Leanne over at She Can Quilt, and each quarter people list the unfinished projects that they hope to finish. Then they post again to show the finished projects! First up on my "To Do" list for Q3 is to finish my King Chevron commissioned quilt (1/4 of the quilt is shown above). This will be my biggest quilt ever! I thought I had the blocks all cut and trimmed, but when I started laying it out on my design wall yesterday, I quickly eliminated 4 of my fabrics. That means I need fabric for about 40 more squares. So last night I electronically went shopping, and now I'm waiting for more fabrics to arrive before I can proceed. Blocks for the King Chevron quilt are everywhere as I mix and match and try to get the right balanced layout on the design wall. My HST Diamond Value Quilt just needs to be bound. The next project on my list is my Half-Square Triangle Diamond Value Quilt. This one is soooo close to being done and listed in my store. All I need to do is hand-stitch the binding to the back! My pink & green Scrappy Trips Around the World quilt. Please excuse the iPhone photo! Third on the list is my version of the Scrappy Trips Around the World quilt. This was actually a quilt-a-long quilt and I've got the top & backing done. Now I just need to layer, baste, quilt, & bind it! Last on my list is this project (shown below). I'm not even sure what to call it, other than "Scrappy Turquoise." It isn't quite a "rail fence" quilt. I guess I could go with "Turquoise Strip Quilt." Maybe in the process of working on it, something will come to me. Regardless, it has a long way to go. The strips are all sewn together, and now I need to cut/trim the blocks, lay them all out, and assemble the top before I even talk about the rest of the steps. It would be a long-shot for me to complete this one this quarter. But why not shoot for the moon?